The REF 10 features a clean, intuitive user interface with noble aesthetics. The MUTEC REF 10 is an audiophile reference master clock generating 10 MHz signals to significantly improve digital playback systems. Engineered around a handcrafted, ultra-low phase noise (i.e. jitter) oven-controlled oscillator (OCXO) made in Germany, it delivers industry-leading performance and exceptional sound quality. As the conductor of your digital audio orchestra at home, the REF 10 will inspire with unheard-of clarity, graceful dynamics, and pure music. It is the most flexible, most compatible 10 MHz clock on the market allowing customers to spend less time worrying about integration and leaving them with more hours to enjoy blissful playback. The final result of MUTEC's extensive efforts is the REF 10: a superior 10 MHz reference master clock and the first Empyreal Class product combining uncompromising engineering with the beauty of simplicity and the utmost clock precision. Due to its ultra-low noise characteristics and its unrivaled flexibility the REF 10 can enhance the audio quality of compatible D/A converters (DACs) and re-clockers, music servers, and audio clocks to the highest possible level. It is the perfect match and ideal upgrade for MUTEC's 10 MHz ready products like the MC‑3+ and MC‑3+USB Smart Clocks. Eight simultaneous clock outputs at both 50 and 75 &ohm; impedance allow using the REF 10 in combination with not just MUTEC products, but also 10 MHz compatible products by all other third-party manufacturers, such as Esoteric, dCS, or SOtM, for example. 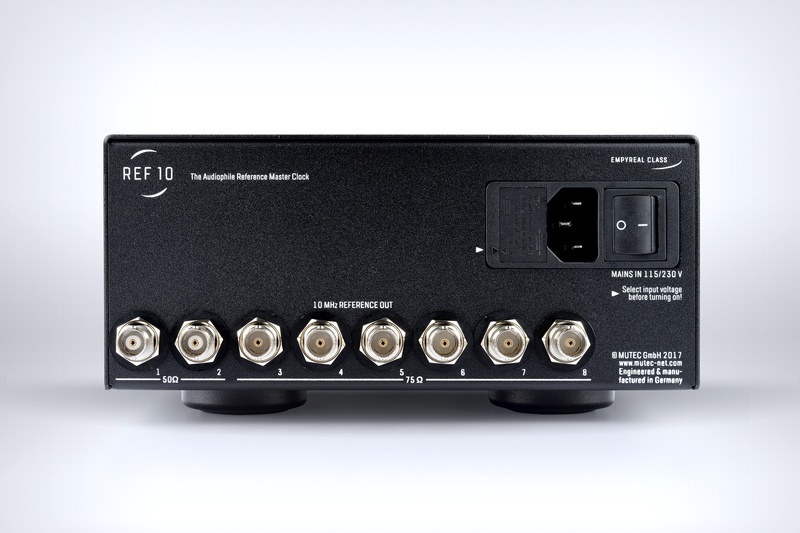 Two 50 &ohm; outputs and six 75 &ohm; outputs make the REF 10 the ideal centerpiece for digital setups of any size. MUTEC's research has shown that the high clock stability of so-called "atomic clocks" based on a rubidium or cesium oscillator is limited to the long-term time domain. While this long-term stability may be useful for some telecommunications applications, it is essentially irrelevant for digital audio purposes. Instead, it's the short-term stability measured as jitter or phase-noise that really matters for high-end audio. In contrast to these "atomic clocks" then, the REF 10 is engineered around MUTEC's handcrafted, oven-controlled oscillator (OCXO) made in Germany, featuring highest clock stability in the time domain relevant for audiophile digital audio performance. As the centerpiece of a digital system the REF 10 will unlock a more dynamic, more transparent sound stage with exceptional spatiality and level of detail, free from any digital blur. For all music enthusiasts reaching for the pinnacle of signal purity, audio quality, and clock precision, the REF 10 is the must-have expansion to conduct your digital playback chain. The REF 10 was premiered at the Munich High End show this past May and will be available for a list price of 3598.00 € including German VAT at the end of July 2017. 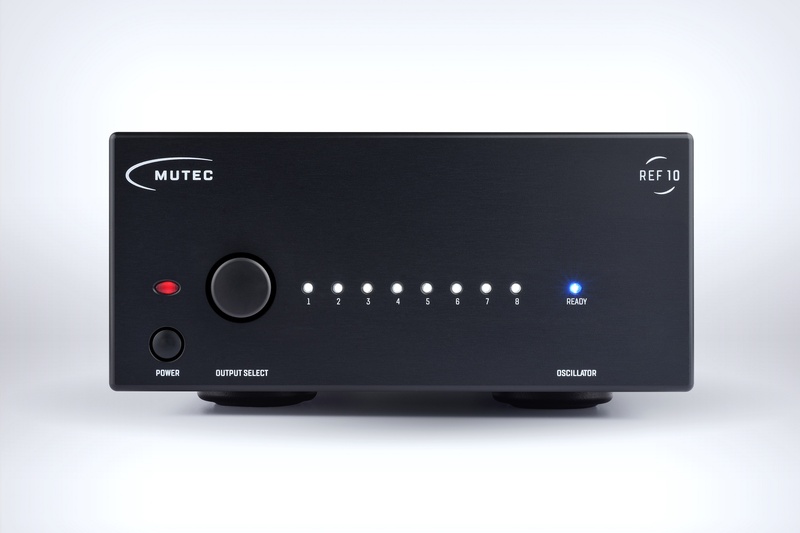 MUTEC’s Empyreal Class reflects the company's commitment to Hi-Fi in its most sophisticated form. This series combines uncompromising engineering with the beauty of simplicity and utmost precision. Apart from exceptional sound performance these products feature a streamlined interface with fewer parameters and user-friendly operation. Any Empyreal Class product is an investment in highest audio quality "Made in Germany" - an aspiration reflected by our extended manufacturer-guaranteed warranty of three years.